Welcome to the website, online catalog, and information center for Casa de las Orquideas in sunny Southern California! We specialize in high color and unusual cymbidiums bred in California, and grown outdoors under shadecloth for the local pot plant trade and the serious collector. Click on the links to topics on the left or the links to the categories above to visit our online catalog, to learn more about us and a wealth of other information and orchid photos! We speak only English. 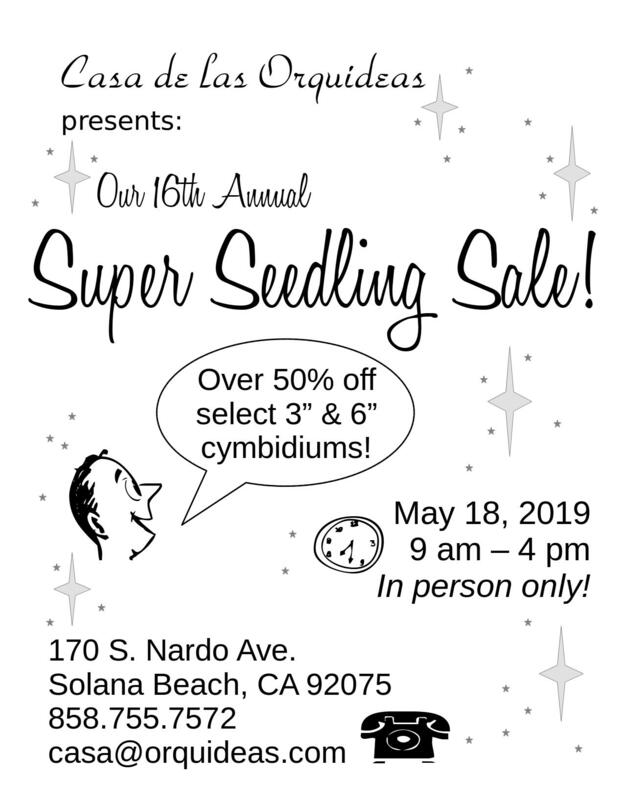 It's almost time for our end-of-season Seedling Sale coming up on Saturday, May 18th.Click here for the flier! We have updated listings for all seedling and meristem lists in the catalog section! Also, check out our just-updated cymbidium division list for 2018-19! Shipments of plants to Florida, Hawaii, Puerto Rico, Louisiana and Mississippi require inspection by state agricultural department personnel which will add $40 to the cost of the order. We accept Visa, Mastercard, and Discover for plant purchases. The site is changed as our product list and information changes, and will be periodically updated to add new information. Please come back later to see what's new! All information and photographs listed herein are copyrighted by Loren Batchman/Casa de las Orquideas. Permission is granted to use any information and images contained herein, provided author, web location and publishing source (if applicable) are referenced with use. High resolution images of many of the photos on this site are available. To arrange for use of these images, please contact us.